Kerry has been food gardening for 4 years in Chapel Hill, NC. Why did you originally start gardening? 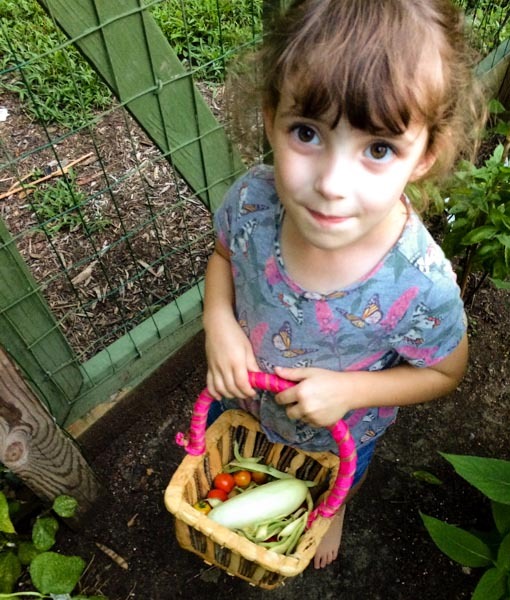 When my second child was on the way, I felt driven to teach her where food really comes from, how it grows, and what it feels like to eat food you’ve grown yourself. As soon as my daughter could waddle around she was in the garden with me learning all that I could teach her. It was especially important to me that she learn that she doesn’t have to be afraid of bees and other bugs and how beneficial they are. I have a fenced garden so it doubled as a play pen when she was too small to operate the door. Best part about this playpen was that I could be with her and it was safe and calm. At the same time, I was looking for something I was passionate about. I have a stressful job that I don’t particularly enjoy most days. When I am in my garden, everything seems as it should be, my mind is calm, and I don’t feel stressed. It keeps me sane! Kerry’s daughter with a nice harvest of delicious goodies from the family garden. What’s the most rewarding thing you’ve experienced in/from your organic garden? To me, every day is a reward. I am a born skeptic, so every time a seed sprouts, I am truly amazed. But if I have to pick one thing this year it’s probably growing the ‘Who Gets Kissed’ corn. I’d never grown corn before and knew nothing about it. I just wanted to try it out so I only planted 4 seeds. I discovered that it was wind-pollinated and since I planted so few seeds (in a line and not a square), I pollinated it by hand. I learned so much. The day I harvested the first ear of corn, peeled open the husk, and saw that beautiful thing, I felt like a child who just got the best present ever. It was the best feeling in the world and it tasted so good too. Just thinking about it makes me happy. My biggest challenge is focusing on my soil. I’ve never tackled cover crops, testing the soil, or amendments and I know I am missing out there. If I could focus on that more, I know my garden would be better. A handful of ground cherries from the Anthony’s garden. Ground cherries are a husked fruit that taste like a combination of pineapple, tomato, and citrus. Quite hard to describe, but oh so delicious! One of many varieties of heirloom produce that you’ll never see in a grocery store. What’s the most interesting thing you’ve learned from organic gardening that you want other people to know? The most interesting thing I have learned is about how a rich insect life protects my plants. I never knew there were so many beneficial insects in the world. I always thought that any bug on a plant was a bad thing! Oh how misled I was! This year was not only a journey of learning about new foods I could grow but also about beneficial insects. I learned to love seeing wasps, to try not to worry about pests so much, and to trust that if I had the right mix of plants for beneficial insects, my food would grow much better. Superwoman releases a newly emerged Black Swallowtail butterfly into the garden. What an awesome place to grow up and learn about the world, hands-on! What do you like best about GrowJourney so far? 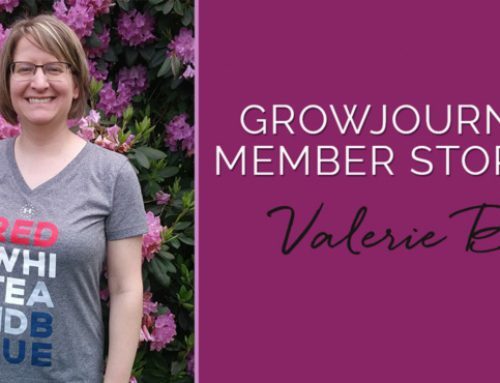 My husband is a champion gift giver–he bought me the GrowJourney subscription for Mother’s Day. Each month when the seeds come, I am reminded of his love for me and of my love for gardening. With GrowJourney, I don’t have to decide what seeds to buy! Seed catalogs are so overwhelming to me. I cherish the fact that GrowJourney does the research for me, finds and selects great varieties, and sends them to my door. Then I have a smaller, more manageable decision to make (how many seeds to plant this year), a direction for further research (like why is it called ‘who gets kissed’), and a whole new adventure to enjoy (watching it grow). 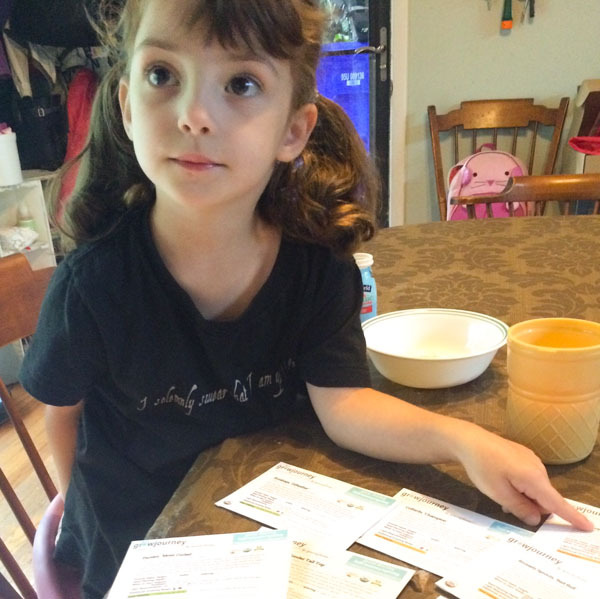 Kerry’s daughter helping to choose which seeds make it into the garden. Anything else you’d like to share about what you’ve learned or how organic gardening has helped shape your perspective? Organic gardening has changed the way I look at the world. In my garden, I try to bring things in, not keep things out. I plant flowers around my food plants so that I can bring in beneficial insects to pollinate my food and feed off of pests. It’s about being open instead of closed, about facing fears (like wasps and failure), dealing with uncertainty, and experiencing joy. A beautiful ‘Silver Slicer’ cucumber from Kerry’s garden. Notice in the top photo how she has fleabane (small white flowers) and chicory (edible greens with blue/purple flowers) growing right next to her cucumbers to help attract beneficial insects (predators and pollinators). Also, notice the small native bee pollinating the yellow cucumber blossom. 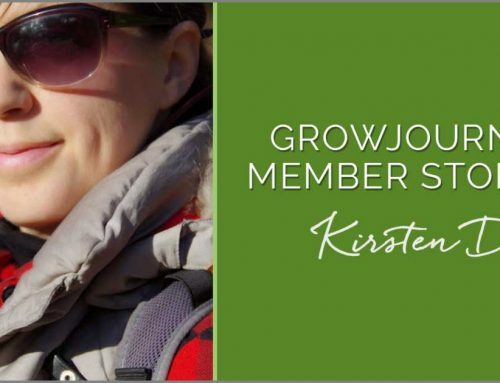 Follow Kerry’s “grow journey” on Instagram! Note from Aaron @ GrowJourney: This interview is why we do what we do! This is exactly what we want more people to experience! Imagine if every yard in North American were managed as thoughtfully as Kerry’s. As for the name origin of ‘Who Gets Kissed’ corn? It’s named for an old corn-shucking tradition where the villager who found the odd-colored ear of corn got a kiss. Since this is a bicolor variety with white and yellow ears, you’re guaranteed to get a kiss!